Will humans ever posses the technology to revive a dead person back to life? Dr. James Hiram Bedford certainly hopes so. He has been waiting for that day for the last fifty years frozen in a lab at the Alcor Life Extension Foundation. James Hiram Bedford was an American psychology professor at the University of California. Prior to his death in 1967, Bedford expressed his desire to be cryogenically frozen so that his body could be repaired and his consciousness revived with more advanced technology, when they become available, sometime in the distant future. Bedford was suffering from kidney cancer that had metastasized into his lungs. Death, he knew, was imminent. He quickly willed $100,000 for the preservation of his body. A team of “experts” arrived and began to prepare the body. 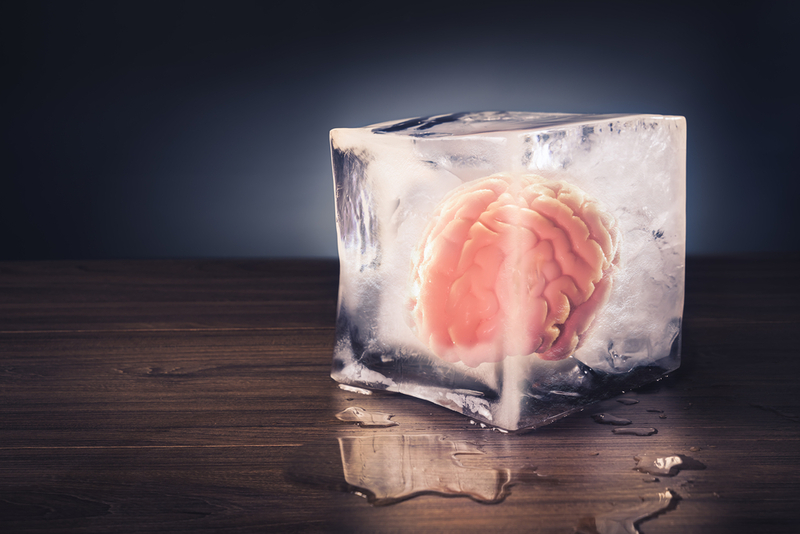 Adapting techniques from the field of cryogenics, which studies materials at low temperatures, they injected medical-grade antifreeze into his bloodstream while continuing to pump oxygen through his system to minimize damage to his brain. His body was then put inside a capsule packed with dry ice (about –79 degree centigrade), before putting him in a liquid nitrogen environment at –196 degree centigrade. 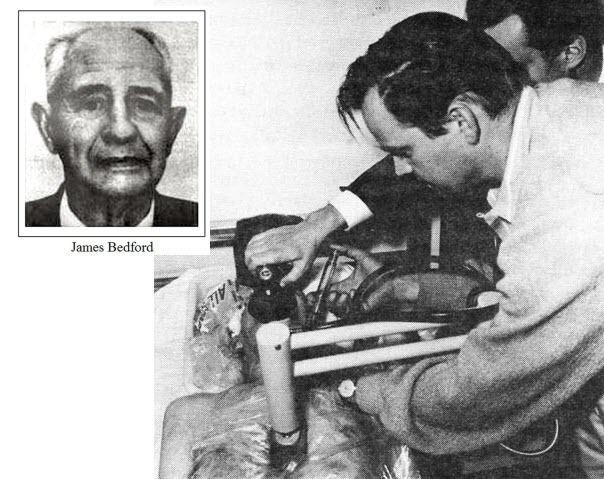 Bedford is injected with dimethyl sulfoxide following his death on the afternoon of 12 January, 1967. For the next two years, Bedford’s body was stored at a facility in Phoenix, Arizona, then moved to a new facility in California. Eight years later, Bedford’s frozen body was shifted again while Bedford’s son and wife continued to fight his relative’s demand that the doctor be thawed and interred. The cost of preserving his body and the court battles long exhausted the $100,000 Bedford had set aside for this little experiment. At one point, frustrated by the high cost of storage, Bedford’s son moved his father’s body to a self-storage facility and periodically topped the container with liquid nitrogen themselves. In 1982, Bedford’s body was entrusted to Alcor Life Extension Foundation where it has remained ever since, but how well his body was preserved is open to question. An examination made in 1991 found the upper body and neck, as well as his arms, discolored and red as if inflamed from an infection. His nose was flattened as a result of being compressed by a slab of dry ice during initial freezing, and the skin on his chest had cracked. If Bedford is ever revived he will most certainly look like a ghost. Some of the canisters where bodies are preserved. A single canister can hold four whole-bodies and five heads. 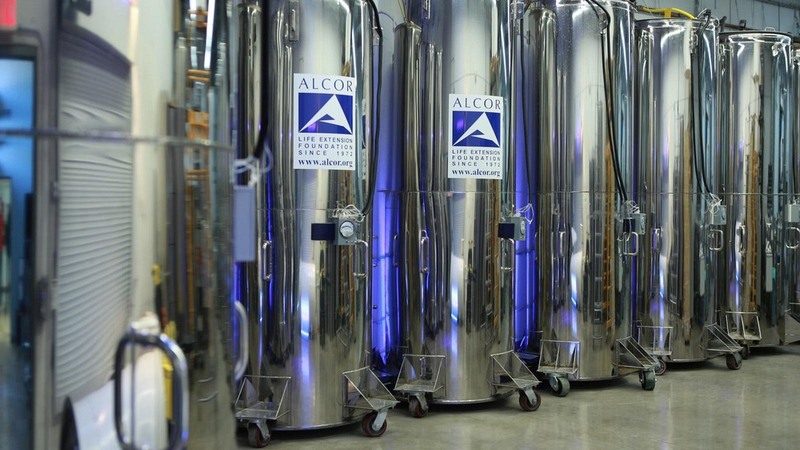 But the hope that the future will change continues to drive customers to the three commercial cryonics facilities in the world—Alcor, the Cryonics Institute in Clinton Township, Michigan, and KrioRus near Moscow. Over 300 bodies and brains are currently preserved in between them, with 3,000 more signed up to join them. They include people mostly from the US, closely followed by the UK, Canada, Australia and Germany.